Eastern girls bowling celebrates after qualifying for the Group 4 state championship on Feb. 2. 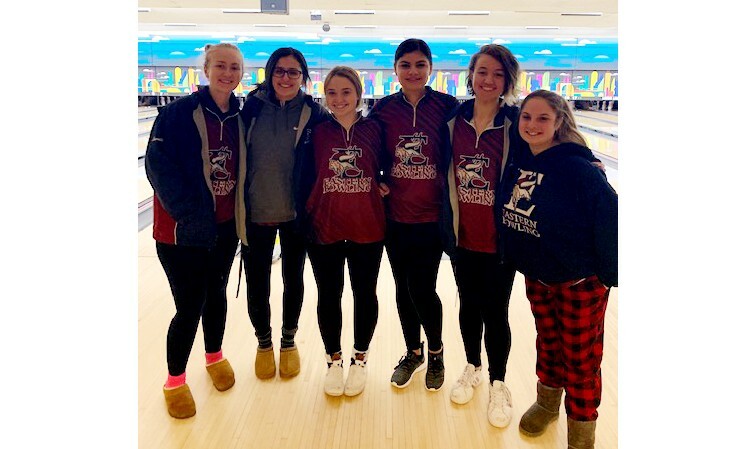 Eastern Regional High School seniors Hailey Dadi, Cloe Lowell and Ryann Werner started their high school bowling careers with a trip to states in 2016. Now, the three are finishing their careers with a return to the state championships after the Vikings’ took second place in the South Jersey Group 4 sectional tournament on Feb. 2. The second-place finish qualified Eastern for the Group 4 state championships for the second time in four years. The girls bowling team championships are scheduled to take place on Monday, Feb. 11. “I think it was a really great finish to our senior season, to achieve that one more time before we finish high school,” Dadi said. Eastern qualified for states with a team consisting of three experienced seniors who have excelled on the big stage in the past and three underclassmen who showed strong improvement over the course of the season. Freshman Madison Feldschneider, sophomore Isabella Giampetro and sophomore Sandra Garneau gave the Vikings the depth necessary to match up with anyone in South Jersey. Eastern lost just one match in the regular season, an early season meeting with Washington Township High School in December. Eastern’s three seniors are all four-year varsity starters and remember how much guidance they received from the upperclassmen as freshmen. This year, the roles were reversed with Dadi, Lowell and Werner serving as the team’s leaders. Garneau felt the leadership of the seniors helped the younger bowlers improve over the course of the season. The Vikings were red-hot entering sectionals on Feb. 2, having gone undefeated since early December and having avenged their earlier loss against Washington Township with a win over the Minutemaids on Jan. 10. Eastern also got an assist when a previous South Jersey Group 4 power, Brick Memorial High School, was shifted to Central Jersey as part of an NJSIAA group realignment this year. Regardless of the opposition, the Vikings were focused only on their own scores, knowing they could make states if they bowled to their potential. “Honestly, I think even if (Brick Memorial) were there, we all had the idea we could do it, just because our freshman year we did it,” Dadi said. “(Washington) Township is such a good competitor and going into state sectionals, to keep our heads into the game, we had to worry about our own scores,” Werner added. At sectionals, Toms River North easily took first place in South Group 4 with a score of 3,096. With two teams in each section advancing to states, the Vikings found themselves in a battle with Washington Township for the last state qualification berth. When the tournament ended, the Vikings finished with a team total of 2,455, and edged out Washington Township by 94 pins to send the team to states. Eastern also received individual accolades at the sectional tournament. Both Dadi and Werner finished in the top-18 in South Jersey to qualify for the NJSIAA individual state tournament, scheduled for Friday, Feb. 15. Werner led Eastern and finished in 12th place overall with a 556 series at sectionals, while Dadi bowled a 534 series to tie for 18th place with Central Regional High School’s Madison McFadden. It is the first time both seniors have qualified for the individual tournament and the first time Eastern has had multiple bowlers qualify for the individual state tournament in the same year in at least 20 years. While the three seniors will wrap up their high school bowling careers on a high note, the three underclassmen are determined to carry on Eastern’s recent winning ways. Giampetro wants the team to make trips to states an annual occurrence. “We want to make it back every year to states so we can have that awesome feeling again,” Giampetro said.